Burmese food is almost becoming a thing in Vancouver, with Laksa King (previously Bo Laksa King), Amay’s House and now Wahh Tee. 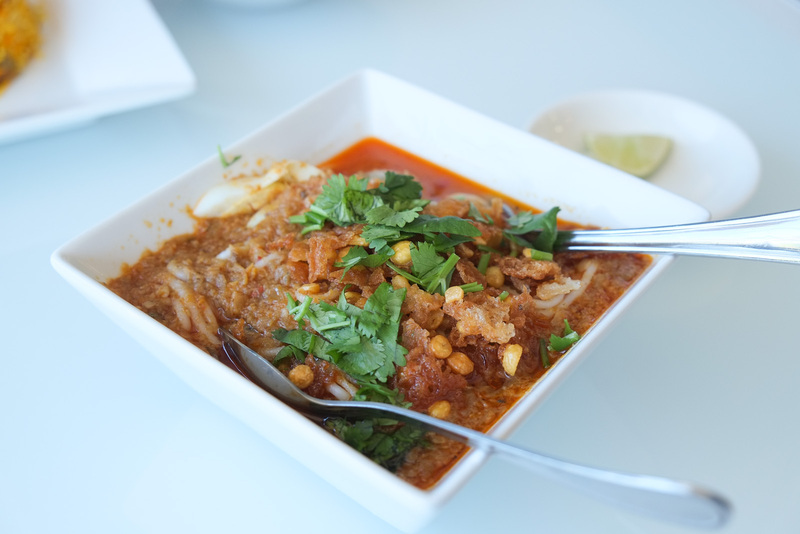 Burmese food in Vancouver still isn’t at the level of say Burma Superstar in San Francisco, but with more places popping up, hopefully it will lead to a more developed scene. 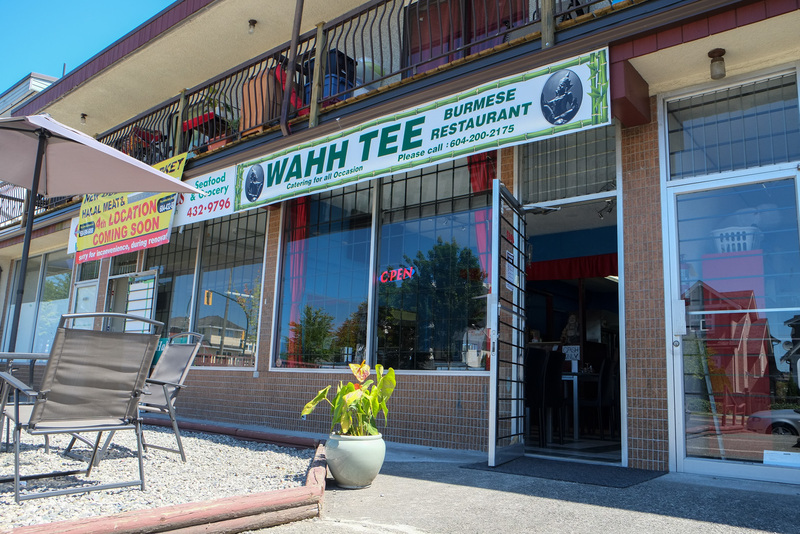 Wahh Tee is located on Joyce St., just a bit north of Joyce Skytrain Station. Ironically, Wahh Tee is a couple doors down from the convenience store where the original location of Bo Laksa King was way back in 2009. 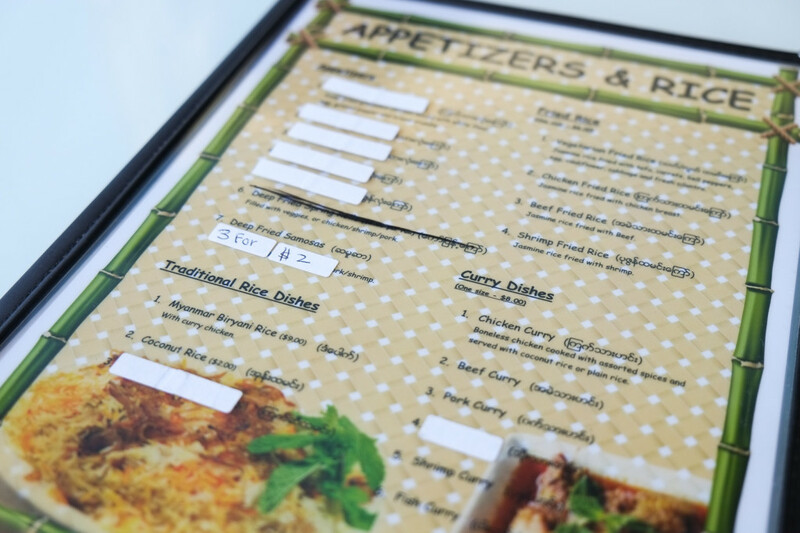 They’ve been tweaking the menu with stickers. Good that they’re removing stuff that they can’t execute or doesn’t sell well. 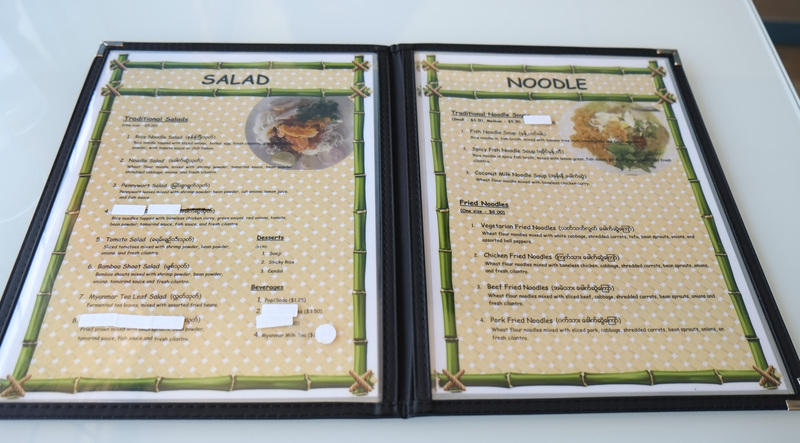 They removed the large size of the noodle soups for some reason. Appetizer section got slashed. Fried chicken/beef/pork/fish/shrimp balls are gone. No more Hainanese Chicken. Samosas are veggie-only now, but cheaper at 3 for $2. 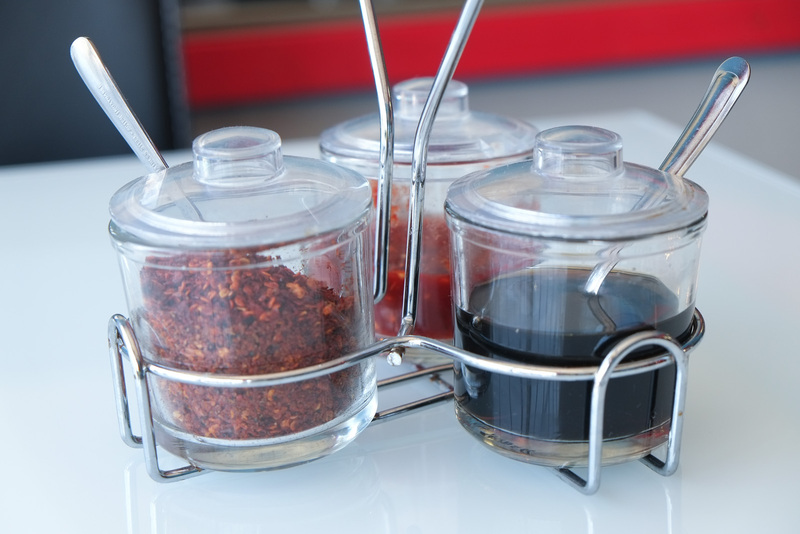 Condiments: those killer hot smoky chili flakes, sambal oelek and what I think is soy sauce. Spicy Fish Noodle Soup (aka Mohinga), medium size. Broth was watery and doesn’t reach the level of Burma Superstar (SF) nor the very first time we ate at Amay’s House. Crunchy fried lentil bits are good but the weak broth let the dish down. 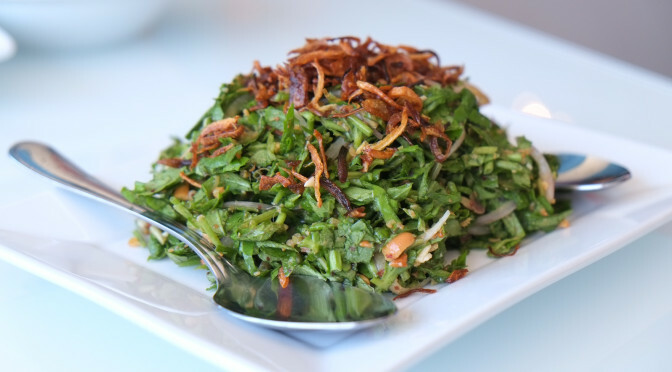 Pennywort Salad with shrimp powder, bean powder, onions, lemon juice and fish sauce. It was a bit like eating chopped-up cilantro with leaves and stems but with the taste of romaine lettuce with a hint of grassiness. 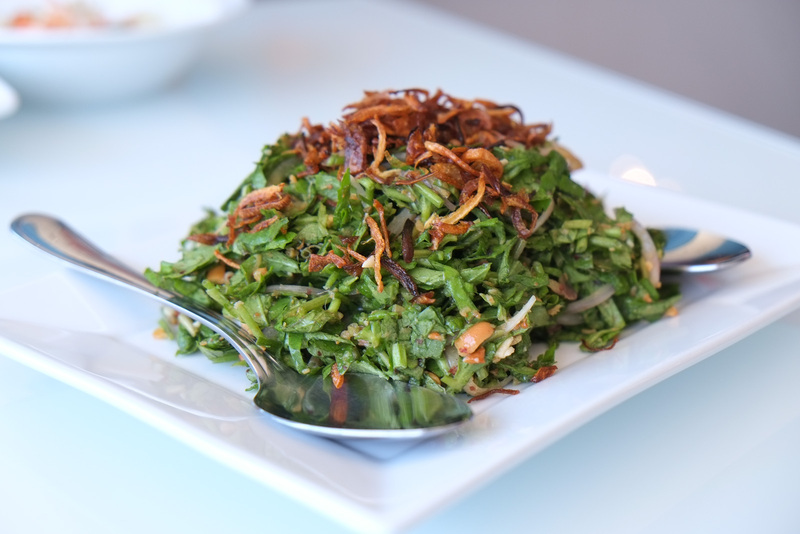 Wicca’s enjoyed pennywort drinks in the past but this was our first time eating pennywort salad. She loved it while I thought it was missing a little something. 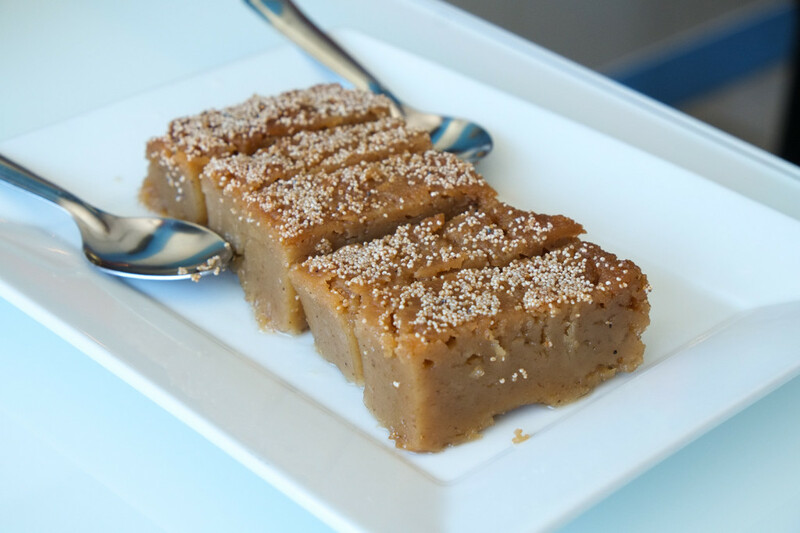 The mysterious Sooji dessert. As far as I know, it’s cream of wheat made into a steamed dessert. White poppyseeds on top. It’s only slightly sweet with subtle flavours of brown sugar. Reminds me of Chinese glutinous steamed cakes or a really dense flan. We actually went a bit overboard with the dried chili flakes on our biryani so this dessert came in handy to cool down the heat on our tongues. This is a small restaurant with a big heart. Homestyle cooking with friendly service. 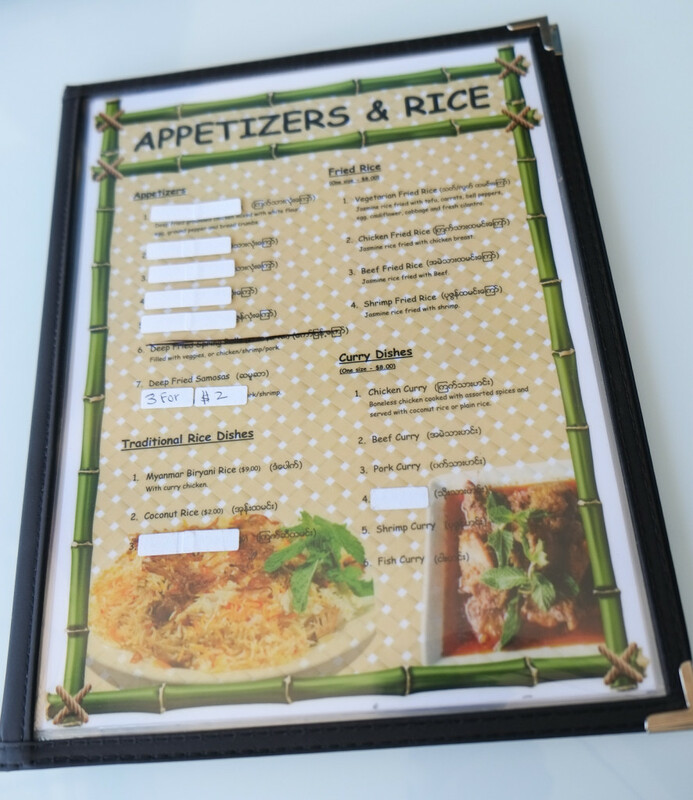 The menu is small but it should be that way. 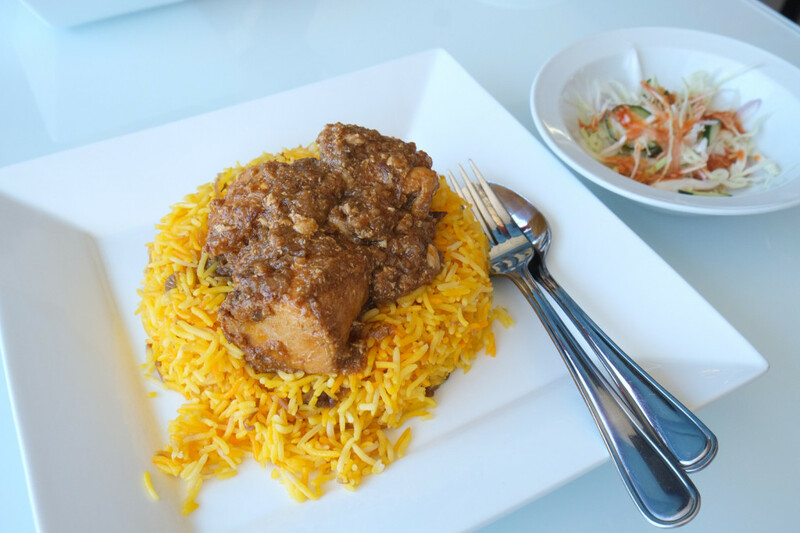 I wanna come back to try that biryani with pork. 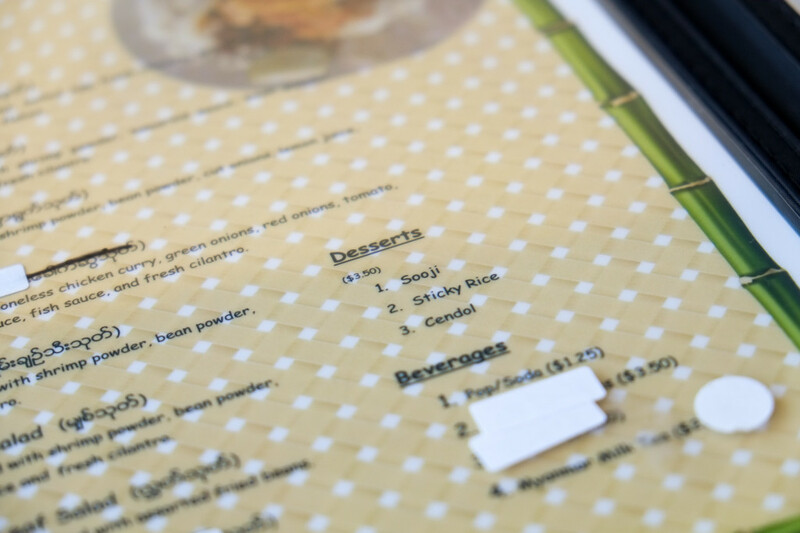 Hmm, I just read on their facebook page that Amay’s discontinued their Hainanese chicken as well… interesting. I’m looking forward to trying both places when the temps drop a bit! Glad you made it, Dennis! And on a day when Mohinga was on board. 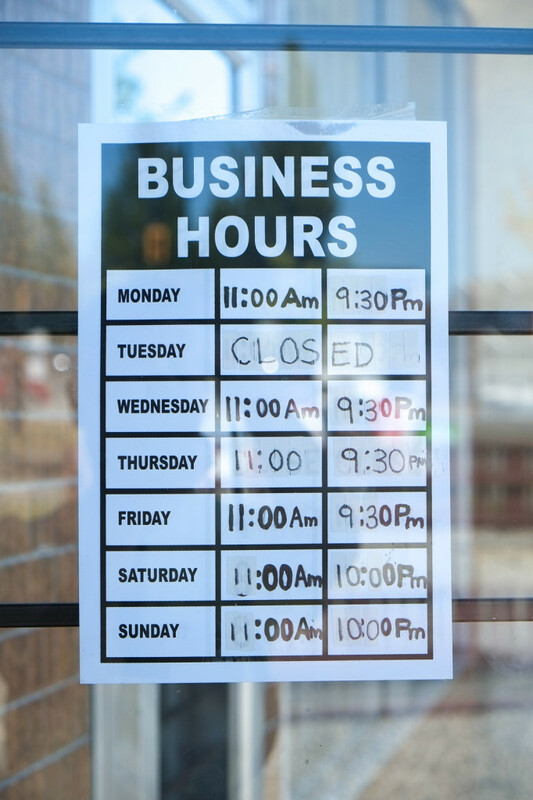 Guess it’s hard to keep the full menu in a small space with limited clientele. Still, good effort by these folk. The spicy mohinga was the best version I’ve had — once you add the lime and the hot sauce, it is really well balanced, fish tasting without being fishy, and less muddy/chowderish than others I’ve sampled. The tea leaf salad was a bit one note, and the tea leaf itself not as flavourful as I’ve had elsewhere.